Zeus looked at the mainframe computer with great fear. “How can they do this? I’m not that evil to do something like this,” he said to himself. Just then, General Ruthless entered the room. “Hold, intruder!” he shouted as he raised his gun towards Zeus. Zeus then fell to his knees and had his hands up in the air. “Please, don’t kill me” he pleaded. “Why shouldn’t I do that? I’ve caught you in our mainframe computer. You know too much of our plans for the universe” stated General Ruthless angrily. “Please? I’ll do anything,” pleaded Zeus. General Ruthless then thought for a moment. “Very well. You’re Professor Zeus, are you not?” he asked. “I am” said Zeus as he stood up slowly. “You have been long time enemies with the Rogue Warriors, right?” asked General Ruthless. “Ok. The Empire already knows the location to your home planet. But we can’t attempt a second invasion until the Rogue Warriors have been destroyed” explained General Ruthless. “Hey, if you’re saying that I should join up with you, then you’re sadly mistaken” said Zeus angrily. “No. The Metrolian Empire is the most superior race in the entire universe! We never join forces with other races. One of the Rogue Warriors is not the same race as you or the others,” explained General Ruthless. “What? The Polymorphs?” asked Zeus. “No. 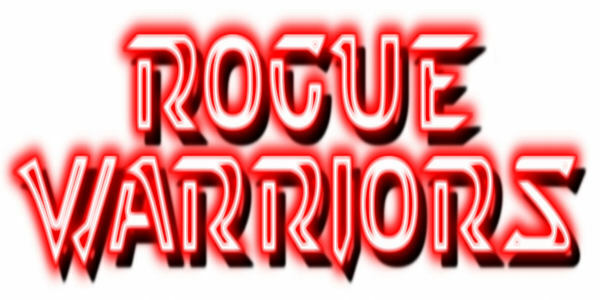 We are aware that the Polymorphs are in league with the Rogue Warriors,” stated General Ruthless. “Oh. Then you mean the Human called Simon?” asked Zeus. “Yes. We liked to know the location of his home planet, so we can use that as a staging area for the attack on the Rogue Warriors” explained General Ruthless. Zeus broke a cold sweat. “Professor. I’m waiting!” said General Ruthless impatiently. “Oh alright. It’s Earth,” said Zeus. “Earth? I always assumed that was a pompous planet that wasn’t of any use,” stated General Ruthless. “Really? Well, I wouldn’t take Earth lightly if I were you. They have multiple armed forces all over the planet,” explained Zeus. “Ha! Like all the other races we’ve encountered, Humans are weak and in inferior beings and will be no match for the great Metrolian Empire!” stated General Ruthless confidently. “Good luck with that” said Zeus as he made a quick escape. Zeus Quickly ran towards the exit and retreated back to his ship. A Metrolian trooper attempted to chase after him, but was quickly stopped by General Ruthless. “Sir? What are you doing? He knows too much of our plans” objected the trooper. “He wouldn’t have gone far and he isn’t much of a threat. Besides, we have the location of a new planet to conquer,” stated General Ruthless. “But, Sir?” objected the trooper. “Trooper, do not go after him or I’ll kill you myself! Ready my shuttle. I’m going to return to the Emperor’s warship with the news,” ordered General Ruthless. “Yes, Sir” said the trooper cautiously. Meanwhile on the Enterprise, Simon was asleep in his quarters. He constantly mumbled and shifted side to side, as if he was in a nightmare. His dream revealed that he stood on a metal floor, casing and explosives surrounded him. His face looked shocked as all the explosives detonated around him. Simon then woke up from his nightmare with a gasp. He was breathing at a fast rate and sweat poured down his face. “What the hell was that?” he thought to himself. Simon then took one look round his quarters. He then put his head back down on the pillow. “That was some weird nightmare,” he thought to himself as he drifted back to sleep. General Ruthless’s shuttle had just landed in the Emperor’s warship. He made his way to the bridge. He then approached the Emperor. “My lord, I have some news,” stated General Ruthless. “What is it, General?” asked the Emperor. “I had caught the one called ‘Professor Zeus’ hacking into our main computer system on base 32 in the Draco system” reported General Ruthless. “Zeus hacking in our systems?” said the Emperor confused. “Yes. When I was about to kill him, he pleaded for his life” explained General Ruthless. “Humph! Stupid pitiful creatures! What did you do?” asked the Emperor. “I demanded the location of one of the Rogue Warriors planet. The Human called Simon. His planet is known as Earth,” explained General Ruthless. “Excellent work, General. I take it that you killed Zeus afterwards?” asked the Emperor. “I’m afraid not,” said General Ruthless. “He attempted a quick escape, but I just let him go,” explained General Ruthless. “YOU IDIOT! HE HAS THE KNOWLEDGE OF OUR PLANS FOR THE UNIVERSE!! HE HAS SEEN TOO MUCH!! !” yelled the Emperor with extreme rage. “B-but I felt that he wasn’t any threat to the Empire even with the knowledge of our plans” explained General Ruthless nervously. “Well, I feel that I have no longer any need of your opinions. Guards, take this traitor to the brig. You all know what to do with him afterwards” stated the Emperor angrily. Some troopers approached General Ruthless and took him away from the bridge. The Emperor then pondered for a second. “It won’t be long till the Rogue Warriors are aware of our plans. I think it’s time that we invaded Earth. Trooper, send a sub spaced message to all available Metrolian ships and tell them to rendezvous to our coordinates,” ordered the Emperor. “Yes, sir” said the trooper as he worked on his station. That morning, back on the Enterprise, Simon made his way towards the bridge with his nightmare that was still in his thoughts. He entered the bridge. The other Rogue Warriors were there as well. Carol approached and hugged him. She then took one look at Simon. “Whoa. Simon, you don’t look so good” she said with concern. “I know. I had a bad night,” said Simon as he rubbed the sleepiness from his eyes. The others then approached him. “Simon, you look like that you had a sleepless night. Are you ok?” asked Chucky. “I’m fine. I just had a strange nightmare,” stated Simon. “Do you wanna talk about it?” asked Charles. “Well, I don’t remember much, but I can only recall that I’m standing in the middle of some explosives and they blew up around me,” explained Simon. “So, you died in your dream?” asked Helen. “Yeah. But the strange thing was, it felt so real, as if I was there right now” stated Simon. “Don’t worry, Simon. It was just a dream. It can’t predict future events otherwise there would be no excitement in anybody’s lives” reassured Carol. “Yeah. I’m mean, you’ll get over it within a few hours. Don’t let it bother you too much” stated Cathy. “Don’t worry, Cathy. I won’t” said Simon. Dave then worked on Chucky’s station. “Guys? I’m picking up a few Slethearian ships approaching our location,” he stated. “Ah. They probably want us to help them retake their planet,” concluded Charles. “They’re hailing us,” said Chucky as he went back to his station. “Put it on the view screen” ordered Charles. The screen lowered and the Slethearian General appeared on it. “General. What is it this time?” asked Charles. “We’ve got no time to lose, Rogue Warriors. My intelligence team has informed me that the Metrolian Emperor is gathering a large army and is setting a course for the planet Earth” explained the General. “WHAT? !” yelled Simon in shocked. “Simon, we are aware that you are from that planet. That is why we’ve come to inform you. We best make haste, quickly” stated the General. “Wait a minute. Where’s the rest of your platoon?” asked Dave cautiously. “They are attempting to retake my home planet as we speak. They are capable of that themselves. I’ve just bought a few of my best battleships along with me to help you,” explained the General. “WELL, LETS GO AND KILL THOSE METROLIAN BASTARDS NOW!! !” yelled Simon. “We best make haste now. They’re already making a move,” stated the General. “Well, what can we do?” asked Vicky. “My intelligence team have already made a tactical suggestion. We should head for the Alpha-Centuri system and attempt to hold them off there” suggested the General. “But that’s the next system along from where Earth is” complained Simon. “I’m sorry, but it’s our only option,” stated the General. Charles then thought for a moment. “Alright then, General. You lead the way. We’ll follow you. Simon, set course for the Alpha-Centuri system. Maximum warp” ordered Charles. “Very well, Charles” frowned Simon as he worked on his station. Carol looked at Simon with a concerned look in her eyes. The Enterprise and the Slethearian ships warped into space. After a few hours, the Enterprise and the Slethearian ships dropped out of warp within the Alpha-Centuri system. The system itself was deserted. The Rogue Warriors all worked on their stations as they prepared for battle. “Scan the area, Chucky,” ordered Charles. Chucky then made a quick scan of the entire system. “There’s several planets in this system. They’re all uninhabited. There’s also a star cluster that is 750,000 miles to the east of our position and it’s highly radioactive” stated Chucky. “We clearly don’t wanna go in there,” said Vicky. “Well, there’s nothing left to do but bide our time” stated Charles. “Charles, I’m detecting Metrolian ships coming in fast,” said Chucky suddenly. The Emperor’s warship and lots of Metrolian battleships dropped out of warp in front of the Enterprise and the Slethearian ships. “Dave, Prepare to lock on target with the warship!” ordered Charles. “With pleasure, Charles!” said Dave determinedly. “Charles, the warship is hailing us,” said Simon. Charles just looked on cautiously. “Put it on the view screen” ordered Charles cautiously. The screen lowered and the Emperor appeared on it. “Humph! I must say that you Rogue Warriors are a real pain in my arse!” stated the Emperor angrily. “Greetings, Emperor. How are you feeling?” he asked. “Better than General Ruthless!” stated the Emperor as he picked up General Ruthless’s head with one hand. The Rogue Warriors then gasped. “He allowed the one you call ‘Professor Zeus’ to escape with knowledge for our ultimate plan for this universe” explained the Emperor as he threw General Ruthless’s head to one side. “That is odd of you, Emperor. You killed one of your best Generals,” stated Cathy. “Silence, Polymorph! Every traitor to the Metrolian Empire deserves a painful death. Your fate will be the same as General Ruthless,” stated the Emperor Determinedly. The Emperor then disappeared from the view screen. The Rogue Warriors pondered for a moment. “What does Zeus know about the Metrolians?” asked Carol. “I’m not sure. We’ll have to find out another time. Right now we’ve got the perfect opportunity to destroy the Emperor and his army,” stated Dave determinedly. “You’re right, Dave. Vicky, get the shields up. Simon, begin evasive manoeuvres alpha one on my command. Dave lock on targets and fire when ready!” ordered Charles determinedly. “Right, Charles” said Dave, Vicky and Simon. The Enterprise and the Slethearian ships started to move towards the Metrolian fleet and they opened fire. Meanwhile, Zeus’s ship had dropped out of warp and was in orbit above his home planet. He was about to start the landing cycle but then stopped and he pondered for couple of minutes. He then stood up from his seat and looked at his view screen determinedly. “I know what I must do!” he said to himself with determination. He then worked on his station. His ship then left the planet’s orbit and he warped into space. Meanwhile back in the Alpha-Centuri system, the battle raged between the Metrolians and the Enterprise with the Slethearians. Lots of Metrolian fighters had been destroyed. The Slethearians had taken casualties as well. The Rogue Warriors were in the bridge of the Enterprise as they did their best to fight off the Metrolians. “Shields are dropping to 85%,” stated Chucky. “Make a full rotation to the forward shields, Vicky” ordered Charles. Suddenly, a Metrolian shuttle blasted its way through a few Slethearian ships and blew down the Enterprise Bay doors. It landed inside the Enterprise shortly afterwards. The explosion shook the ship a little bit as it knocked the Rogue Warriors to the floor. “The shuttle bay doors have been blown open. Emergency force field is in place and it’s holding,” stated Helen as she worked on her station. “There are intruders within the shuttle bay!” stated Vicky as she worked on her station. “Chucky, Cathy, Dave, fight off the intruders, now!” ordered Charles. “Right” said Chucky, Cathy and Dave as they stocked up and headed for the shuttle bay. Several Metrolian troopers exited their shuttle. General Deathcall left the shuttle as well. They then made their way down the Enterprise corridors. “Stick together, troops, and focus on the mission objective!” ordered General Deathcall. “Yes, sir” said the Metrolian troopers. Dave, Cathy and Chucky took cover by their quarters. Dave scouted ahead slightly and saw General Deathcall’s troops that approached with determination. Dave then hid back with Cathy and Chucky. “How many are there, Dave?” asked Cathy. “About fifteen of them” stated Dave. “We have to hold them off here. We can’t afford for them to take engineering or the bridge,” explained Chucky. General Deathcall and his troops headed closer to their position. “Ok. Hold them here with your lives. LETS GO!! !” ordered Dave with great Determination and rage in his eyes. Dave, Cathy and Chucky then moved away from their quarters and opened fire on General Deathcall and his troops. The Metrolians returned their fire. After one minute, General Deathcall fired a smoke bomb at Dave, Cathy and Chucky. The smoke gulfed and surrounded the three. Two Metrolian troopers approached and tranquillised Cathy. She then dropped unconscious. As the smoke cleared, Dave and Chucky rubbed their eyes until their vision returned. “Mission accomplished. Fall back to the shuttle!” ordered General Deathcall. Two Metrolian troopers picked up Cathy and took her to the shuttle. “CATHY! !” yelled Chucky as he and Dave tried to chase after them. General Deathcall and his troops made it back to the shuttle with Cathy. The shuttle then took off and penetrated the force field and left the Enterprise. “NO!” yelled Chucky in shock. He then tried to get in one of the fighters to chase after the shuttle, but Dave held him back. “LET GO OF ME, DAVE! !” yelled Chucky. “Don’t be foolish, Chucky! If you try to go after that shuttle yourself, you’ll get killed!” shouted Dave. Chucky then stopped to calm down. “You’re right, Dave. But I can’t leave her there with the Metrolians. They might torture her!” complained Chucky. “Let’s get back to the bridge and inform the others first” stated Dave. They both then headed back to the bridge. Dave and Chucky entered the bridge. “The intruders have left the ship,” said Dave. “Excellent wor… hey, where’s Cathy?” asked Charles. “She’s been taken prisoner by General Deathcall” stated Chucky sadly. “I have to go rescue her!” stated Chucky. “Don’t be stupid, Chucky! You can’t take on an entire Metrolian task force by yourself! You’ll be walking into a death trap!” lectured Vicky. “Well, I don’t care. I can’t just let her die in the hands of the Metrolian scum!” shouted Chucky. “I’m gonna take the shuttle. Do everything you can to get the Metrolian fighters and the battleships off my back. I’m gonna rescue Cathy, whatever it takes!” stated Chucky with determination. “What is it, Simon?” asked Chucky impatiently. “I’m coming with you,” said Simon. “Simon, it’s too dangerous. I don’t want to get you killed,” stated Chucky. “Hey, you’re one of my best friends. Do you really think I’m gonna let you battle out there alone?” asked Simon. “Alright. Come along then” he said. “Right behind you” said Simon. “No, Simon. You can’t. You’ll get killed,” objected Carol fearfully. “Don’t worry, Carol. We’ll be fine. We’ll rescue Cathy and be back here in no time” reassured Simon. He then kissed her and left the bridge. “Don’t worry, Carol. He’ll be fine” reassured Helen. “I hope that you’re right, Helen” said Carol all concerned. “Ok, lets focus our attention on Chucky’s shuttle making it to the warship safely,” suggested Charles. Carol then ran out of the bridge. “Where is she going?” asked Helen. “Don’t worry, Helen. Simon will convince her to stay on the ship, if she catches up with him” stated Vicky. “Charles, I’m reading another ship entering the system fast” stated Dave as he worked on Chucky’s station. Dave then frowned when he found out who it was. “And just when I thought things couldn’t get any worse. It’s Zeus,” he stated angrily. “Oh great! What does he want now?” asked Vicky angrily. “He’s hailing us, Charles,” said Helen as she worked on her station. “Put it on the view screen, Helen” ordered Charles. The view screen lowered and Zeus appeared on it. “Greetings, Rogue Warriors. I must say that your ship is badly damaged. How might I be of an assistance?” asked Zeus. Charles, Dave, Vicky and Helen looked shocked as their eyes widened. “Yes. I understand the situation we’re all in and I have the knowledge of the Metrolians true plans for this universe,” stated Zeus. “What are there plans, Professor?” asked Vicky cautiously. “We all already know that they want to conquer virtually every planet in the universe. But they not only want to enslave other races, they also wish to genetically engineer them into Metrolian troopers” explained Zeus. Everyone in the Enterprise Bridge gasped with shock. “You mean, they want to turn other alien races into the Metrolians?” asked Helen fearfully. “That explains why captain Kruger looked like he was being tortured back in the Lynx system,” stated Vicky. The others then looked at her with confusion. “Don’t you guys get it? He wasn’t just being tortured, he was being genetically altered into a Metrolian soldier” explained Vicky. The others then looked shocked. “That’s right, Vicky. They’re gonna disregard and destroy all races until only the Metrolians are left in the universe” explained Zeus. “How do we know that this is not another trick? You might turn against us in the last moment again!” stated Dave angrily. “I can assure you that I’m not tricking you this time. I’m here to help you bring down the Metrolian scum and reduce their Empire to rubble. If I didn’t want to help you, then I would be high tailing it to the other end of the galaxy by now” explained Zeus. Everyone on the Enterprise Bridge thought for a second. Charles started to smile and chuckle. “Professor, when this is all over, we all owe you a drink” smirked Charles. “Ha. Forget a drink, Charles. I’ll buy the nearest bar in the galaxy and we’ll all celebrate a glorious victory. Now then, lets get to work!” stated Zeus with determination. He then disappeared from the view screen. “Well, you heard the man. Lets get to work!” ordered Charles determinedly. Whilst the Slethearian ships battled the Metrolian Battleships, The Enterprise and Zeus’s ship opened fire on all the Metrolian fighters to clear the way for the Enterprise shuttle towards the Emperor’s warship. Chucky and Simon were in the shuttle. “Were closing in on the warship. Prepare yourself, Simon,” stated Chucky. Simon then started to get a headache. “AH! OW!” he yelled in pain as he fell to the floor. “What’s wrong?” asked Chucky as he got to his aid. Simon then closed his eyes and could only think back to his nightmare. It revealed that he placed the explosives on the metal floor casing himself and armed them. A few seconds later, they ignited around him and he got caught in the huge explosion. Simon opened his eyes and he looked terrified. “What’s wrong, Simon?” asked Chucky with concern. “I… I can remember more about my nightmare,” he said fearfully as he got up. “Simon, can we discuss that later? We have to focus on rescuing Cathy,” stated Chucky. “But the explosives. I remember that in my nightmare, I placed them around me and armed them myself. It was as if I wanted to remain there deliberately and it felt so real,” stated Simon with fear. “Simon, it was just a dream. Lots of people have weird dreams like that. Now prepare yourself. I’m blasting a hole in the warship’s bay doors,” stated Chucky as he worked on his station. As the battle raged, the Enterprise shuttle opened fire in a concentrated pattern towards the warship at the bay doors. The shuttle penetrated the shield and blew open the bay doors. The Enterprise shuttle crash-landed within the warship shuttle bay. Chucky and Simon exited the shuttle with their weapons. A few Metrolian troopers were in the shuttle bay. Chucky and Simon shot and killed all of them. “Ok. Cathy could be anywhere on this warship. Lets split up and try to look for her” suggested Chucky. “Ok, I’ll head for their engineering and the other decks around there. I’ll try to bring down this ships power while I’m at it” stated Simon. “Good idea, Simon. Good luck,” said Chucky as he headed down the corridor. Simon then headed to the opposite direction. As he made is way towards the main corridor, Simon hid round the corner of the doorway as he saw that the main corridor was filled with Metrolian troops as they tried to fix the damage done to the warship. “Great! How am I gonna get past them, undetected?” He thought to himself. Just then, a large adder approached and quickly constricted around Simon. “What the hell? !” he chocked. Just then, the adder turned into Carol. She then kissed Simon multiple times on his face. “Carol? What the hell are you doing here?” shouted Simon. “I’ve come here to help you” she stated. “But it’s too dangerous. You could get killed. I want you back on the Enterprise where it’s safe!” stated Simon angrily. “Do you think that it’s easy for me not knowing what will happen to you? Besides, Cathy and I are the last of my kind. If anyone’s gonna help you and Chucky rescue her, it should be me!” stated Carol determinedly. “This isn’t a good idea. Stay low and keep up with me!” ordered Simon in an annoyed fashion. After about five minutes, Simon and Carol made it to engineering. They then killed all the Metrolian troopers within that room. They both came across and started to work on a high tech computer. After about five minutes, Simon’s eyes then lit up. “Carol look at this” he said happily. “What is it?” asked Carol as she approached Simon. “Look. All of the Metrolians are linked to here. Their home planet, all the other planets they control, their spare ships, everything leads back here” stated Simon happily. “What do you mean?” asked Carol all confused. “I mean that we just need to destroy this ship and the entire Metrolian race will be wiped out. The destruction of this ship will cause all of the cybernetics in their brains to short circuit and shutdown. That will kill them all stone dead,” explained Simon. Carol’s eyes then lit up with pure happiness. “Oh, Simon. I love you so much! We could actually kill them all?” she asked happily as she hugged Simon. They both then kissed each other and then hugged shortly afterwards. Something then caught Carol’s eye. “There’s something glowing over there,” she stated as she pointed to the engine core. Simon and Carol approached the core. “What is it, Carol?” asked Simon. “It… it can’t be! I don’t believe it!” said Carol fearfully.